In fifth pAsuram – AzhwAr asks “How can I leave emperumAn who attracted me through his causelss mercy by showing his beautiful divine eyes just like he did that with the cow-herd girls even though I was ignorant about him and was attached to matters other than him?”. Subsequently, AzhwAr says that after knowing about the favours done by emperumAn to him, he cannot leave him. 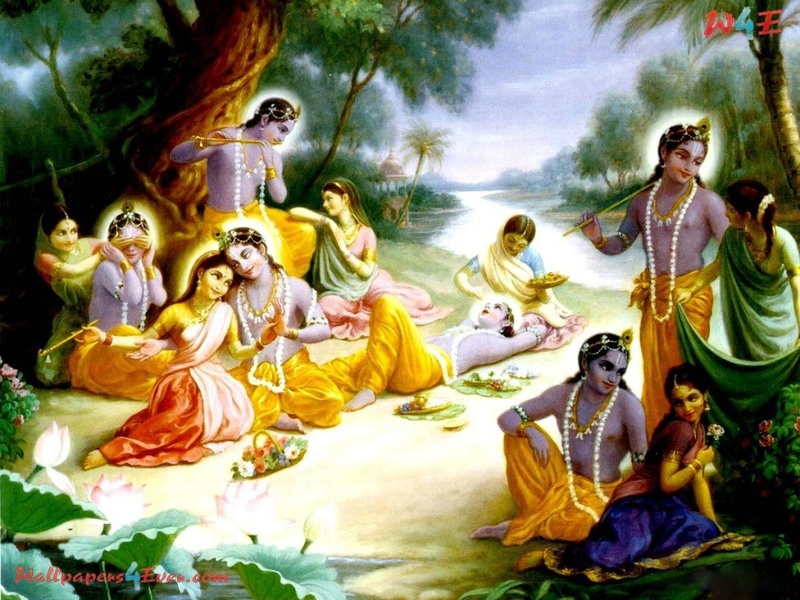 Fifth pAsuram – AzhwAr says that he will leave emperumAn when the gOpis of AyarpAdi (gOkulam) will give up krishNa and desire for paramapadham [which does not happen – they are so attached to krishNa only]. viduvEnO – can I leave him? How can I leave emperumAn who is the one who lights my true knowledge, who entered my soul at the opportune time to uplift me, who is the one performing favours such as the mischievous pastimes with the youthful cow-herd girls by exchanging subtle glances, etc., with them [and there by attracting them to be totally dependent on him]? pirAn here indicates the favours done by emperumAn in manifesting these divine activities to AzhwAr. viduvEnO en viLakkai – bhagavAn, due to his causeless mercy, who revealed his true nature, forms, qualities and wealth to remove my ignorance about my own self. Why is he saying “en viLakkai” (my lamp)? Would he not shine for others and remove their ignorance? No one has attachment towards emperumAn like AzhwAr has. Only when there is attachment, bhagavAn will shine. viLakku (lamp) is that which shows itself and other things – bhagavAn too showed him (para svarUpam – nature of bhagavAn), svasvarUpam (nature of AzhwAr – jIvAthmA who is subservient to bhagavAn) and virOdhi svarUpam (nature of the obstacles) [In arumpadham, it is explained that this highlights artha panchakam – by explaining para svarUpam, upAya svarUpam (him being the means) is also explained and by explaining svasvarUpam – kainkaryam (service as the goal) is also explained]. ennAviyai … – my soul (me) which neither realized the existence of the self nor having attachment towards bhagavAn. naduvE vanthu – arriving without any reason (causeless mercy). Though I was running behind worldly pleasures, he came to my rescue. uyyakkoLginRa – he does not give up after accepting me, he nurtures me. As explained in thaiththiriya upanishath, Anandhavalli, previously I was like “asannEva sa bhavathi” [as good as non-existing] and transformed as in “santhamEnam thathO vidhu:” (due to knowing brahmam, others know him to be existing). emperumAn asks AzhwAr, “You told ‘en Avi‘ (my AthmA), why should I uplift your AthmA?”. nAthanai – Whose property is being destroyed here? Is there anything like “me”? Because you are the owner, you uplifted me. When asked “Why should any one try for the benefit of some one else?”, AzhwAr says “who tried for the upliftment of the cow-herd girls in AyarpAdi?”. thoduvE seythu – Steals, etc., and gets caught intentionally so that many girls (who got affected by him) will come and see him get caught. iLa Aychchiyar – By saying Aychchiyar (cow-herd girls), AzhwAr differentiates them from men; By saying iLavAychchiyar (young cow-herd girls), AzhwAr differentiates from them from older-women. Men can protect themselves and older-women are protected by their children [young girls are helpless and thus protected by krishNa himself]. Also men and older-women have less attachment towards krishNa in comparison to the young cow-herd girls of AyarpAdi. kaNNinuL vidavE seythu vizhikkum – glancing at the girls which can only by understood by them. AzhwAr himself says in thiruvAimozhi 9.10.9 “thUthu sey kaNgaL” (eyes which can transmit messages). pirAnaiyE – just like mesmerizing those girls and made them to be totally surrendered to him, he did the same to me. How can I leave him? This entry was posted in thiruvAimozhi, thiruvAimozhi 1st centum on September 11, 2015 by Sarathy Thothathri.